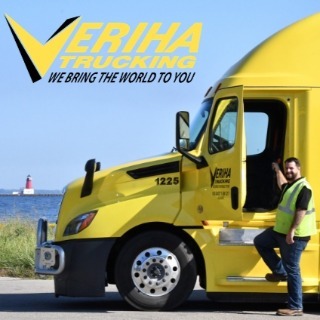 Driving Redesigned for Class A CDL Drivers, Midwest Region - Marinette, Wisconsin - Veriha Trucking, Inc.
Company Name: Veriha Trucking, Inc.
Stop the chase – we welcome you home! Call 866-779-5078 for more information or apply now! Veriha Trucking is a dry van company that operates in all 48 states with lanes primarily in the Midwest and Northeast corridors. Our Corporate Headquarters is in Marinette, WI. We have terminals in Green Bay, WI & Neenah, WI along with Milton, PA.
More About Veriha Trucking, Inc.
Veriha Trucking, a Woman-Owned Business Enterprise (WBE) is family owned and operated, safety conscious Wisconsin based truckload carrier. Since starting out in 1978, Veriha continues to grow and prosper. Our corporate office is in Marinette, WI with offices in Green Bay & Neenah, WI and Milton, PA. We have a fleet of 270 trucks and 700 trailers. We remain financially solid and are investing in the future by using industry leading technology and purchasing new equipment, including trucks that operate using compressed natural gas instead of diesel fuel. Our forward thinking professionals, innovative equipment and advanced technologies make us a valued transportation partner with many of the nation’s Fortune 100 companies.